The promise of CuSiC metal matrix composites (MMCs) as a thermal management material is to provide increased power density and high reliability for advanced electronic systems. CuSiC will offer high thermal conductivity between 250 and 325 W/mK with corresponding adjustable thermal expansion coefficient between 8.0 and 12.5 ppm/∘C. The major challenge in development of these materials is control of the interface interactions. Cu and SiC react at high temperatures between 850 and 1150∘C, needed for fabrication of the CuSiC material, with an expected decrease in thermal conductivity of the CuSiC MMCs as the Si product of reaction dissolves into the Cu. 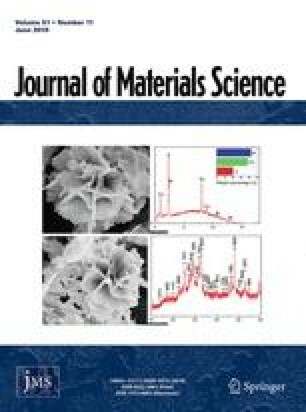 The application of barrier coatings onto SiC was observed to control chemical reaction of Cu and SiC. In the current study, the effectiveness of four barriers to prevent Cu diffusion and reaction with SiC were evaluated between 850 to 1150∘C. Immersion experiments were conducted at 1150∘C to understand the reaction between copper and silicon carbide. Reaction products were identified with transmission electron microscopy (TEM) and electron diffraction. Laser flash thermal diffusivity measurements confirmed thermal conductivity to decrease with increasing silicon content of the copper as determined by induction coupled plasma mass spectrometry (ICPMS) and glow discharge mass spectrometry (GDMS). An erratum to this article is available at http://dx.doi.org/10.1007/s10853-005-4583-y.